Let it be said that I still want to go to space. 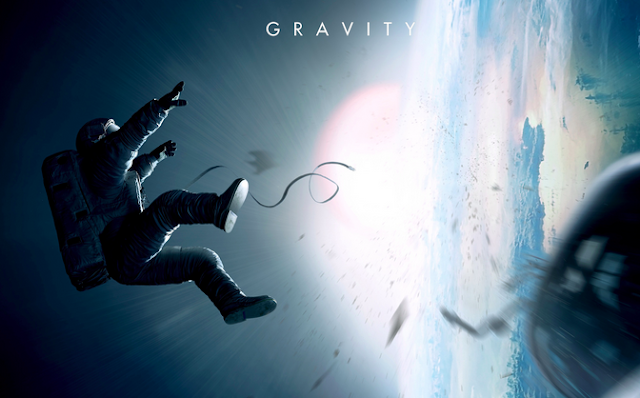 The trailer for Gravity only mildly hooked me, as much as I love space...and Sandra Bullock and George Clooney. But then my friend told me that it was getting insane praise, including a 98% on Rotten Tomatoes, so I was like, "Sure, let's do this." Go see it...unless you can't handle anxiety or get easily motion sick. (I did see it in 3D, but regardless, there was a lot of spinning in this movie.) One of the guys I was with said it was one of the best movies he's ever seen. For me, it was more like Castaway -- an awesome, thought-provoking movie that I enjoyed but probably won't watch repeatedly. Other than the stunning space visuals, I really liked some of the deeper metaphorical stuff in the movie about courage, recovery and rebirth. I can't find the exact quote online just yet, but at one point there were these words that just spoke to me. It went something like, "I'm either going to come back with one hell of a story, or die in an explosion in the next 10 minutes. Either way, it'll be one hell of a ride." ...kind of reminds me of the whole move-to-California-by-myself thing I pulled off this summer, eh? I love that mentality. Go all in, because...why not? It made me consider if I'm currently holding myself back from anything in my life. Always a good topic to ponder. Anyone else seen it yet? Thoughts? I'm going to see this in 3D with my mom tomorrow afternoon. And, I totally want to go to space. My dad used to work with some guys at NASA and I thought that meant he'd get to go to space. No such luck. But maybe, someday, I'll get to go. Because that would be the single coolest thing I can think of. Well, it'd be even cooler if Jesus came with me. AWESOME.. I might go check it out saturday! Thank you so so so mucH! I got your email and almost screamed. haha! I LOVE those cards and am so darn excited about them. Thanks darling!! A sleek, smooth, immersive, and rather overwhelming spectacle of economy, efficiency, and all-around proficiency.